The Audience module provides the ability to create custom lead forms which allow you to capture viewer information as videos are played inside of Brightcove players. The lead data is sent to, and processed by, HubSpot. 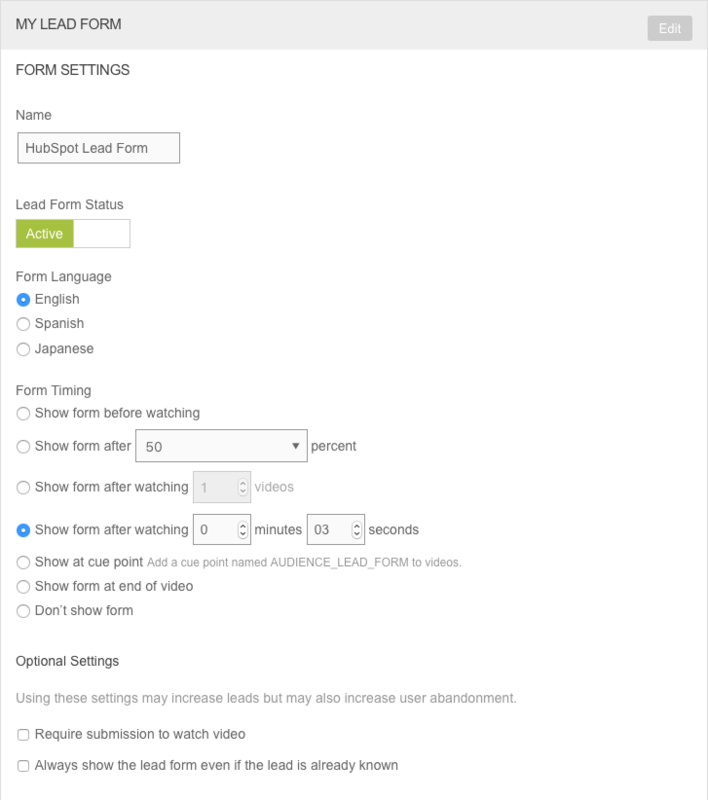 Create a form in HubSpot. Copy and edit the form embed code. 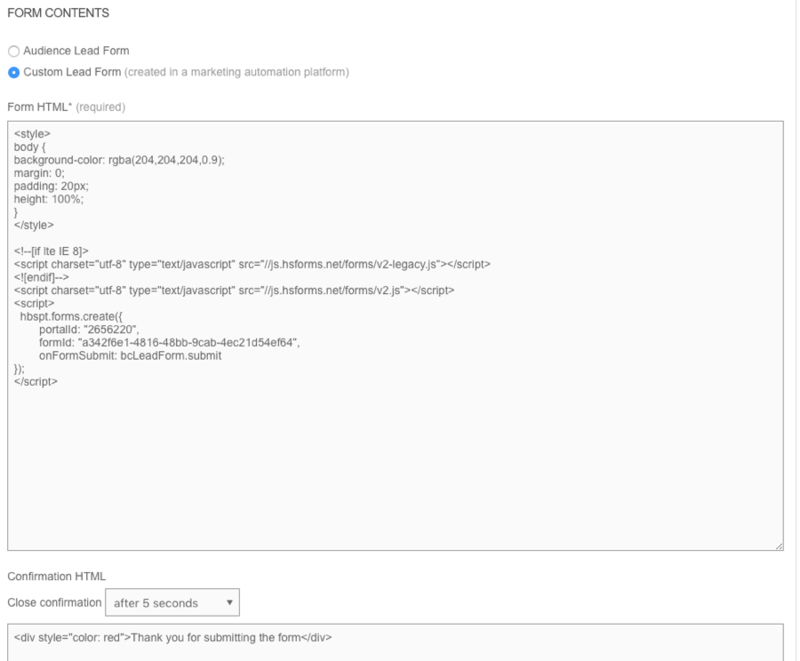 Validate the form data in HubSpot. HubSpot forms can be used to generate lead information from website visitors. These forms can also be displayed inside of Brightcove players. The steps below will create a simple form to capture viewer information. For complete details on HubSpot forms, see the HubSpot documentation. Sign in to your HubSpot account. Click Marketing > Lead Capture > Forms. If you are using the Classic menu, click Contacts > Forms. Click Create form. 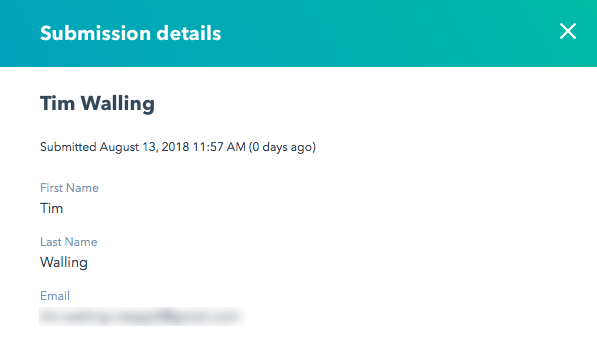 By default, the form will contain an Email field and a Submit button. Click the default name in the header and name the form. Press Enter to save the changes. The Add form field panel contains a list of fields that can be added to the form. Drag and drop the fields that you want on the form to the right side of the page. To make a field required, hover over it and click More > Make required. Required fields display a * next to the field label. For What should happen after a visitor submits this form, click Display a thank you message. Keep the default message as it will never be displayed. Click the Preview link to preview the form. Click Publish to publish the changes to the form. 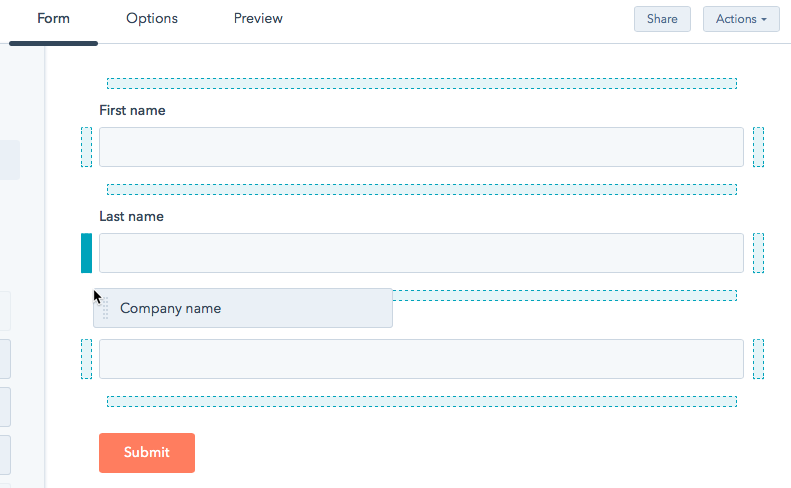 To use the form inside of the Audience module, you will need to copy and edit the form embed code. Also, you may want to do some basic styling to the form. In the steps below, we will copy the form embed code to an HTML editor and then make some styling changes to the form. Click Share in the upper right of the page and copy the Embed code to the clipboard. Paste the embed code into your HTML editor of choice. The embed code needs a small change so Audience knows to close the form when it is submitted. Locate the line that has formId: Add a comma at the end of the line. Add this line below the formId: line. By default, when the form is displayed inside of a Brightcove Player, the form will display on a transparent background over the player. Add the following CSS to the embed code to change the background color to grey. 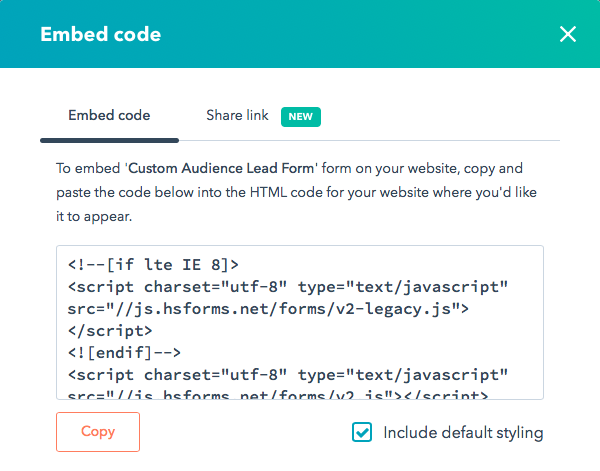 Once the form embed code has been edited, create a custom lead form in the Audience module and associate the lead form with an Audience-enabled player. Paste in the Form embed code. Note: You should style the confirmation HTML so you don't end up with black text on a black background. Leads captured using the custom lead form will be added as contacts in your HubSpot account. An easy way to view data captured by the lead form is to create a Smart List in HubSpot. Click Marketing > Lead Capture > Forms. When you mouseover a form, an Actions menu will appear. Click Actions > View submissions. A list of form submissions will appear. When you mouseover a row, click View submission to view the form data.